To start counting the time elapsing on a job you would need to first Clock-in. To do so, simply locate your appointment in the Calendar, tap on it and click the Clock-In button. After that make sure your username is selected (indicated by the blue color background) and confirm the Clock-In action. Note that while the Employee account type can display only the calendarname corresponding to the user who is logged in, the Supervisor account type, on the other hand, can review and clock-in and clock-out each one of the calendar names of the users allocated to the job! After clocking in, the background color of the user changes to green thus indicating that he/she is currently working on the job. At the end of the shift, press the Clock-Out button to specify the time at which you have finished your work and to proceed to the next step – the creating of the Worksheet. At the moment you press the Clock-Out button the color background of the user name changes to orange to draw your attention to the fact that there are subsequent actions pending. At the end of the shift, after you have clocked-out, you need to complete your daily worksheet. If it is an ongoing job, that stretches throughout several subsequent days or weeks, you would need to first complete your worksheet for the current shift, before you can clock-in and clock-out for the next one within the same job. This means that if you clock in and out on Monday, but skip creating a Worksheet for that day, you can not clock-in and out on Tuesday. Your calendar name background would be orange color coded until you complete the worksheet pending for the previous shift! To create a Worksheet, simply click on the oange button and select the calendar name from the list of available staff. 1. Select the calendar name you will be creating this worksheet for. 2. Aftter that specify the date this worksheet refers to. 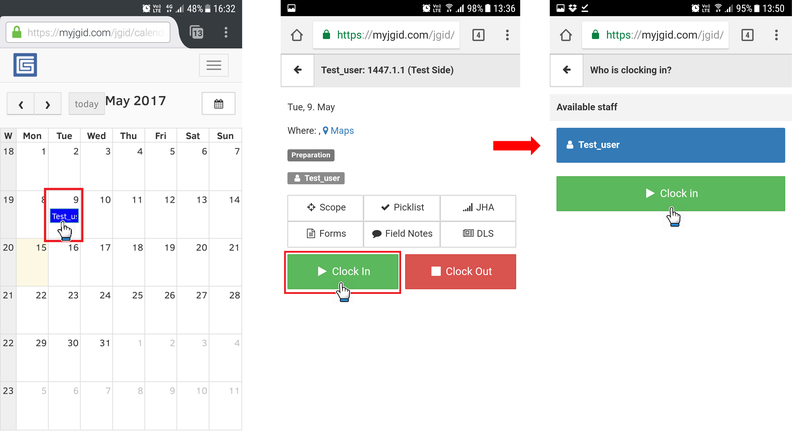 Note, that in most of the cases it would be the current day’s date – which is the default selection, BUT JGID also allows you to create worksheets for previous dates, provided changes are needed. This, however is mailny admin staff prerogative, but can be performed by an employee too. 3. The next step would be to choose the proper rate as per the rate schedule of the company. Typically these rates are 100% for Normal time, 150 % – for Time and half pay rate and 200% for Double time compensation rate. But these names and values are totally customizable and can be adjusted as per the specific company’s rate schedule. 4. 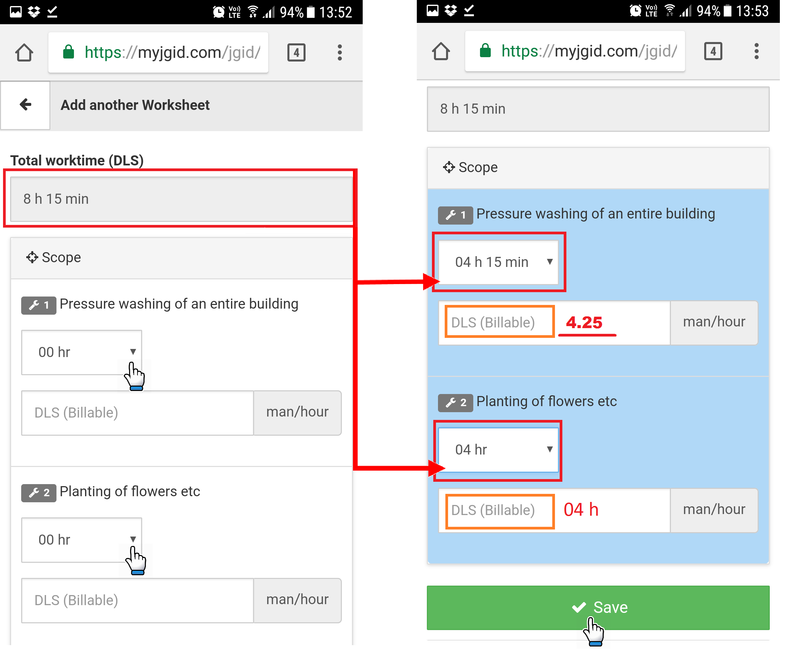 The next set of screens will prompt you to specify the exact Clock-in or Start time and the Clock-out or Finish time of the shift you are making this Worksheet for. 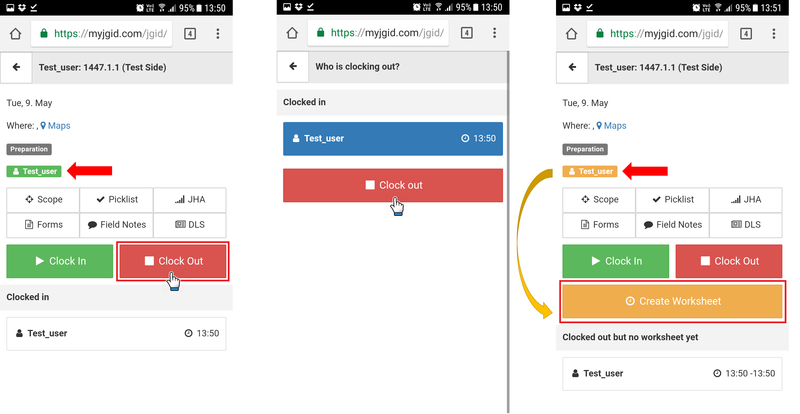 Note, for some reason (lack of internet or depleted battery of the mobile device) you might clock in and out at different times than your actual Start and End hours, still JGID will let you specify the corrrect times as per your actual schedule. Simply use the Interactive Clock tool to specify Start time hours and minutes and the End time hours and minutes. 6. The final stage is to allocate the hours spent on-site, from the Start until the End time listed in the Worksheet, to the services listed in the Scope list of the Job. Note in order to complete a Worksheet, you need to have at least one service in your Job. If you have only materials quoted, then there is no active service that you can allocate hours to. Considering the above mentioned, select the relevant time spans dedicated to each of the services in the list. Note the two options you have at your disposal – a dropdown field to select the Actual Total Worktime and the DLS Time or the so called billable hours. While the sum of the separate values in the dropdown sections for the diffrent services must match the exact value of the Total Worktime, the DLS billable hours can vary. This is specifically designed to allow you to invoice more hours than actually spent on-site, particularly in the case when you have a minimum call out charge fee for a fixed period of time, for example 4 hours. If you complete the job within 2 hours your Start-End Total time will be just 2 hours, yet you need to charge 4 hours due to the provisions of the minimum Call out fee. In this case you will put 2 hours against the relevant service in the Total time dropdown section, but then the number of the billable hours i.e. the hours you will invoice will be 4! 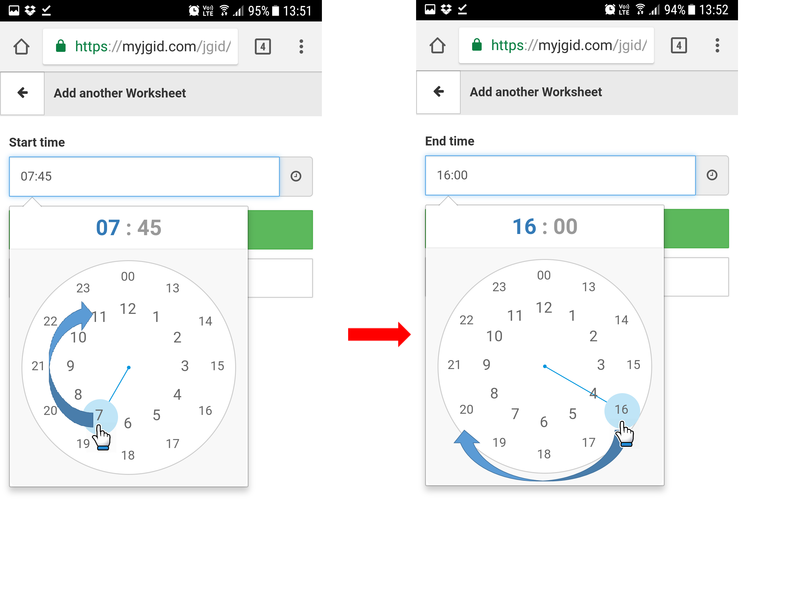 Important: When you are allocating the Total Worktime hours you are dealing with hours and minutes. When on the other hand, you are converting the hours and minutes to quantity units to populate the Billable section, remember that 60 minutes are 100% of the whole 1 hour unit, hence 15 minutes are 0.25 hour units, 30 minutes are 0.5 units, 45 minutes are 0.75 units and etc. 7. Once you have finished allocating hours to the dfferent services, press the Save button to complete your Worksheet!